This map shows details of the Australia plate and vicinity not presented in Tarr and others (2010). 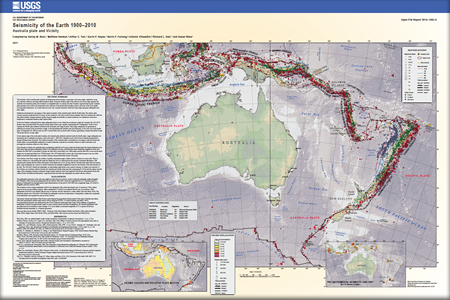 The boundary of the Australia plate includes all fundamental plate boundary components: mid-ocean ridges, subduction zones, arc-continent collisions, and large-offset transform faults. Along the southern edge of the plate the mid-ocean ridge separates the Australia and Antarctica plates and its behavior is straightforward. In contrast, the other boundary segments that ring the Australia plate represent some of the most seismically active elements of the global plate boundary system, and some of the most rapidly evolving plate interactions. As a result, there are some very complex structures which host many large and great earthquakes. Benz H.M., Herman, Matthew, Tarr, A.C., Hayes, G.P., Furlong, K.P., Villasenor, Antonio, Dart, R.L., and Rhea, Susan, 2011, Seismicity of the Earth 1900–2010 Australia plate and vicinity: U.S. Geological Survey Open-File Report 2010–1083-G, scale 1:15,000,000.